Welcome to Cub Scout Pack 226 in Apex, NC! Pack 226 would like to welcome you and your family to Cub Scouts! 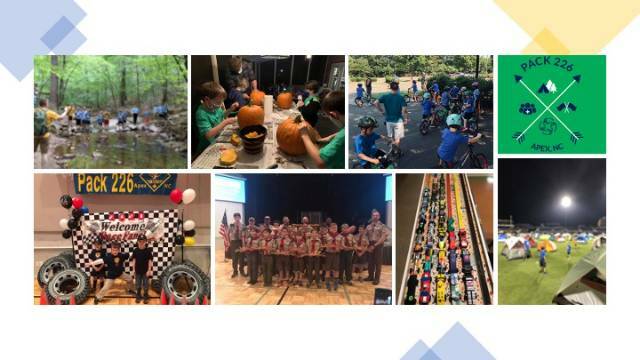 Pack 226 is chartered by Apex United Methodist Church which has graciously provides our Pack with meeting space at Apex UMC and actively supports our Cub Scout program. The Boy Scouts of America provides training to our leaders each year to help us conduct a great program. We have many experienced leaders, most that started out not knowing anything about Cub Scouts but have grown to love the program. In addition to our outdoor program, we also have an exciting Pinewood Derby where the cub scouts and their responsible adults will build a small car out of a block of wood provided by the Pack. In February, we have our Blue and Gold Banquet that celebrates our Webelos achieving the highest Cub Scout Award, that is the Arrow of Light. We deliver back to the community with activities such as Scouting for Food where scouts provide service to those in need, Holiday Mail for Heroes, Gleaning Sweet Potatoes, Scout Sunday, the Apex Christmas Parade, and our annual Popcorn Fundraiser. We strive to be a good neighbor to our Apex and Cary Community! For more information you can contact using the "Contact Us" form. Please view the following attachment for additional information or send us an email using the "Contact Us" form. Congratulations to all of our District Pinewood Derby Racers who came out to race and compete yesterday. I was very proud of all of our kids as we competed very hard and showed a lot of sportsmanship. There was some really fast cars and some cool designs but I think we held our own. Great job everyone! Update: Please signup if you can help reduce our environmental impact by carpooling! 2019 Big Trip Update! Folks there are only 29 days to go before our trip. I am working to put together your info packets this weekend and will have them ready for our info session on March 25th. IF you are able to carpool to the event or if you are looking for a ride, I have setup a carpool page below, please sign up if you can ride share. Sign up for Spring Camping! Cuboree is now open for those who are going. This is a great Council wide event for all of the area Packs to come together and camp out, learn and grow while outdoors. We have had different amounts of scouts at these events and we will try to coordinate efforts as best we can. If there is enough interest we can sing up as a pack and go. Check out the flyer attached for more info. Scout Famlies. We have until Jan 31 to sign up and pay for the big trip this year. Please take two minutes to go to the pack site let us know your intentions.